Look at this St. Patrick Clerical Attire. This Clerical Costume is from our collection of Famous & Iconic Church Characters Outfits. 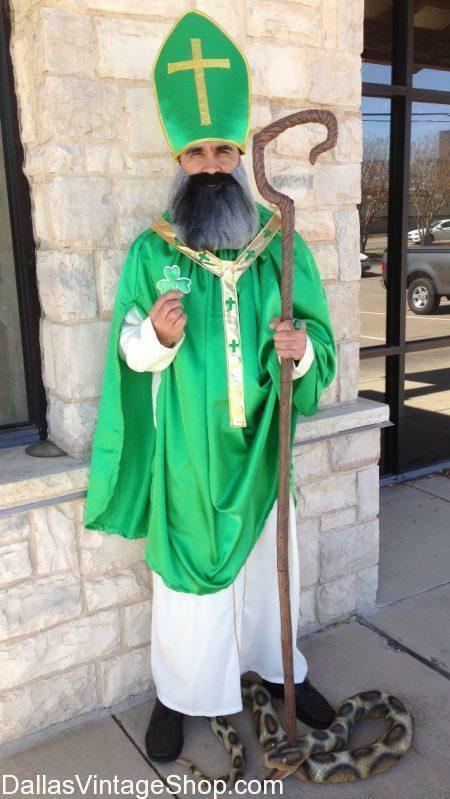 Notice the Creativity of this Irish Liturgical St. Patrick, the Irish Bishop, Outfit. We have Plenty of Irish and St. Patrick’s Day Costumes in stock all year round. Dallas Vintage Shop has Dallas’ largest selection of Iconic, Clerical & Historical Church Costumes. This Pageant Quality St. Patrick, Clerical Outfit is just one of hundreds of Famous Church Fathers, Religious Holiday Characters or Theatrical Church Pageant Outfits we keep in stock all year round. Legend has it that St. Patrick ran the serpents from Ireland, fought the Druids and used the Shamrock to symbolically teach and illustrate the existence of the Holy Trinity. We have Clerical Attire & Costumes for any Church or Liturgical Holiday Iconic Characters imaginable. Get complete clerical costumes or just the Costume pieces you need. We have Wigs, Facial Hair, Hats, Staffs, Robes, Religious Jewelry, Crosses, Crucifixes, Chalices and other Clerical Costume Accessories you need. We are open all year.